Oh, Black Friday – how I love thee. You too? Since I’m Canadian and our Thanksgiving happens in October, Black Friday was never much of a thing here. Sure, we heard about the crazy deep discounts south of the border, but in most cases, it didn’t impact us. Going to the U.S. just to wait in line for hours or deal with huge crowds didn’t seem to make sense. But over the past few years, Black Friday seems to have made its way to Canada, both with Black Friday itself and Cyber Monday. Call it the prominence of American retailers or Canadian companies simply not wanting to lose out on sales, but this girl ain’t complaining. I love a good sale, and one that falls in time to buy holiday gifts is just perfect. Being an avid shopper, I’ve picked up some great tips to make the most of Black Friday discounts. 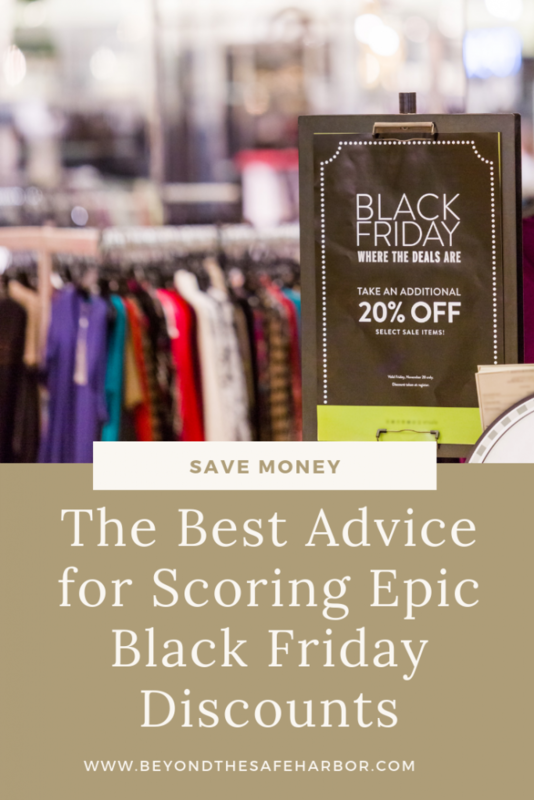 Here are my top recommendations for scoring the best deals with the least effort. Decide who you’re shopping for. Make a list of everyone you need gifts for. You may include yourself if there’s anything you’ve been meaning to pick up just for you! Doing this makes sure you don’t get tempted to buy great aunt Sally something “because it’s a really good deal!” even though she wasn’t on your list. Decide what you’re buying for each of them. Jot down a few ideas (and maybe a budget too!) for each person on your list. If you can come up with specific items, even better! The key is to know what you’re looking for early so that you can shop for those specific types of things when flyers are released. Next to each gift, note any specific things to look for. For example, maybe your sister-in-law loves turquoise and coral so maybe you try to work that into the new planner you’re planning on buying her. This will make it easier to spot the perfect gifts down the road, and will also help in narrowing things down so that it’s less overwhelming. Want a free template to get started? I’ve put one in my free Resource Library in the Shopping section! To gain access, just sign up with your email address below, and I’ll send you the login details. You’ll also find a bunch of other freebies! Looking for inspiration? I have a bunch of gift guides that may spawn some thinking. Are there particular retailers you’re planning on shopping from? Sign up for their e-newsletter so that you don’t miss out on their deals. This will save you time since the information will come to you, versus having to remember which stores to check out. Plus, some retailers offer you a discount code when you sign up for their newsletter, so you may be able to layer that on to any sales they have! If you’re looking to avoid the crowds and save time, doing your Black Friday/Cyber Monday shopping online is key. In fact, I would argue that in some cases you could do ALL of your pre-holiday shopping online. You’ll probably be paying by credit card for most online orders, so consider using a card that will give you rewards based on your spend. If you’re ordering from another country (for example, Canadians ordering from the U.S.), check to see if your key retailers accept your country’s credit card. In the past, if I was ordering something to my aunt’s house in Dallas, I would need to use an American credit card to do so which made things more complicated. If you live near the border, it may be worth renting a PO box in the neighbouring country to receive orders. For example, we live pretty close to the U.S. and could have orders shipped to a PO box in say, Buffalo. This could save us money, give us access to additional stores and products, and we could pick up the items once they’ve arrived. Note that this probably won’t make sense unless you plan to do a lot of shopping, but price it out and see if it works for you! Sign up for Cash Back sites. To make your Black Friday discounts go even further, layer on the cash back, baby! I’m a HUGE fan of cash back sites since they offer additional savings (up to 20% or more, in some cases!) above and beyond retailer discounts. My post How to Save on Online Shopping by Using Cash Back Sites has you covered and signing up through my links scores you an additional $5-10. If shopping online, you can create an online account with the retailer and then load your cart so that when the deals go live, you can check out right away. This means 1) a better chance of items not going out of stock before you get to them; 2) your order being earlier in the queue, meaning it gets shipped out earlier. For example, I can type in “Bose speaker” and see all flyer mentions of Bose speakers from different retailers. This is a really quick way to compare. Don’t forget to factor in coupons, discounts, duties, fees, and shipping costs to make sure you’re comparing apples to apples. …and on the note of coupons, look for opportunities to layer! Sale on sale on sale never looked so good. Stacking savings is every shopper’s dream! While couponing can get a bad reputation, there are efficient ways to find codes and discounts. Sites like RetailMeNot.ca and RetailMeNot.com are fantastic for finding coupons for use in store and online. You can also search Google for “[store] coupon code”, “[store] promo code” and wording like that to find discounts. Lastly, as I mentioned before, signing up for a retailer’s e-newsletter or mailing list often comes with a discount, so consider that too. My last piece of advice is to stay focused on what you actually need and what’s on your list. It can be so tempting to buy a whole bunch of things because the price is so good, but keep in mind that spending money on things you don’t need isn’t a good spend. Wishing you a fun and fruitful Black Friday weekend! I’d love to hear about your hauls – share them in the comments! 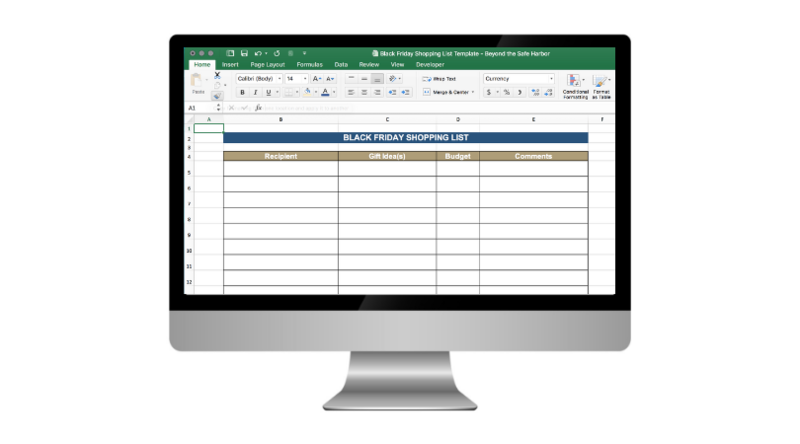 And don’t forget to grab your free Black Friday Shopping List template!